Given that the average golfer spends between three to four hours completing 18 holes, it's very important that they feel their time and money has been well spent. Serious players are not going to leave what amounts to little more than a pitch and putt course feeling any more fulfilled than the over enthusiastic beginner who rolls up to the Old Course at St Andrews only to find he has used up his supply of balls before he's even made the green on the opening hole. Such is the popularity of golf that the number of playing facilities has risen dramatically in the past half century. The English Golf Union states that in England alone it has over 1,800 affiliated courses. For information on where to play locally, refer to your local listings directory or use an internet search engine such as www.uk-golfguide.com. Deciding on a course means assessing both ability and ability to pay. Facilities fall into three basic categories: private members' clubs; proprietary clubs; and municipal courses. Not surprisingly, opting for the private option is the most expensive and, in some cases, will involve having to be proposed by an existing member. These clubs are owned by the members and what you get for your money are well maintained facilities both on and off course and the ability to book the playing time of your choice. Private clubs do also take bookings from non-members, or visitors, on what is termed a pay and play basis, but the available times for teeing off are restricted and in many cases none existent at weekends when the course is inevitably fully subscribed by members.Unlike private members' clubs, which are owned by the members themselves, proprietary clubs, as the name suggests, are the property of a single individual or business. They, too, operate on both a membership and visitor basis. The third category of course, municipal, is owned and maintained by the local council, requires no membership and operates on a pay and play basis. 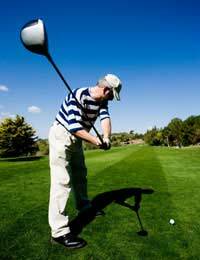 In addition, unlike the other two types of club, an individual does not have to possess a handicap in order to play. Municipals are the ideal option for those starting out in the game because they require little in terms of financial outlay, save the payment of green fees - the cost of a round - and offer the opportunity to play at more popular days of the week not available elsewhere. The physical nature of a course is another aspect to consider. Many have been constructed on parkland and moorland, but links courses are considered the most challenging because by definition their coastal location - the term links refers to a place between the sea and arable land - means a player is fighting the unpredictable weather as well as unforgiving dunes and thick grass. Wind blowing in from the sea can change speed and direction very quickly, requiring a player to adapt quickly or suffer the consequences. Given the choice of where to play, the majority of golfers would plump for the Old Course at St Andrews, one of the links courses that host the British Open Championship, as the ultimate place to enjoy 18 holes. It is a dream that can be made reality as St Andrews is open to the public (visit www.standrews.org.uk for the list of green fees and packages). The only question is how many balls you feel you can afford to lose.